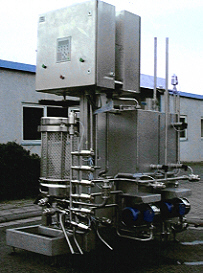 The following types are characterized by its innovative kegging system. 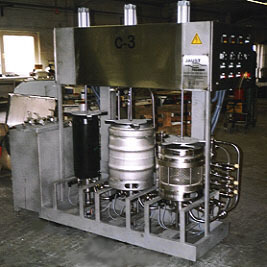 In opposite to our below standing modells MC-1 and MC-2, the KEG´s don`t must transferred from one station to another. 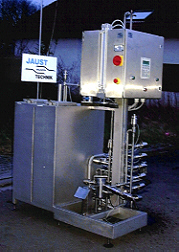 Because entire cleaning-and filling process will be performed upon combi-treatment stations. very compact construction: low space requirement(e.g type Combi C-1 approx. 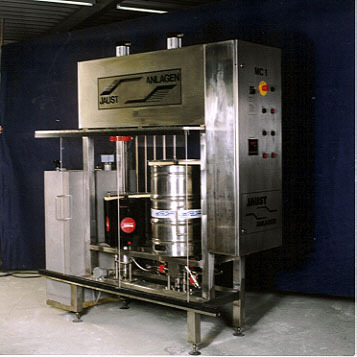 1 m², include fix mounted cleaning agents reservoir 150 l )steering latest technology Siemens S7, user-friendly and safety operation through Operation-Panel OP77A WinCC-Flexible , range of capacities from 17 up to 160 KEG/h -able to fill and clean KEG`s, KEGGY and containers in contents from 10l to 50l by mixed operation without any machine changeover,-suitable to fill beer, wine, water and other fluids, - biological safety during JAUST-Pulsating-Flow-Vent Cleaning system: The combination of pulsating water, intensive pulsating whirled cleaning agents, pulsating hotwater and final steam sterilisation ensures high cleaning effects and maximized biological safety, -as standard three different fully automatic cleaning-intensity-programmes have been integrated(low/medium/intensive) for election, -fully-automatic CIP-cleaning programme of the complete filling system, as well as cleaning in place of brewery-sided piping system possible,ultra-sonic controlling system and pressure sensors guaranties that insides of KEG`s getting dry and mixing of cleaning agents and filling medium is absolute impossible, all filling mediums are smoothly filled with minimum product loss using a differential pressure regulation and a stepples racking speed regulation. CO² gas and Oxygen pick-up is minimized; biological safety during best arranged piping system.